Methodology of Carmen Estévez's online Spanish courses. who wants to learn a language. We don’t speak English in class, so you strive to communicate and you learn much more and faster. The classes are one-on-one so I can prepare a tailor-made program to suit you, and adapted to your needs. Equivalent to levels A2, B1, B2, C1 and C2 of the Common European Framework of Reference for Languages (CEFR). I also offer refresher classes at level A1 for students who need a recap of skills learnt prior to A2. 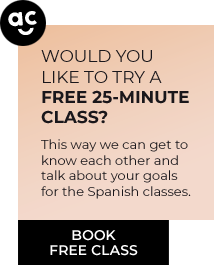 I like teaching Spanish, so get ready to learn. I can explain something to you many times over in different ways so you gain a perfect understanding of the subject in question. I don’t mind repeating and rewriting all the contents of each class. I am here to help you learn; it’s my job. I will give you examples and situations so you can gain a better understanding. Motivation is key to learning, so in my classes I make sure you are going to feel comfortable and learning is going to be very easy.